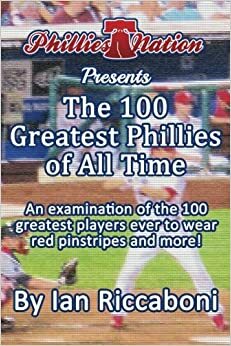 – 100 Greatest Phillies of All Time by Ian Riccaboni – now available on Amazon!! The digital copy is now FREE through April 2 thanks to the support of listeners like you! Head over to Amazon and download your digital copy today! All downloads and reviews help more Phillies fans find the 100 Greatest Phillies of All Time! Thanks for helping make this book #1 in both the paid and free sections of “BASEBALL” on Amazon! This week, Steve Corino and Ian Riccaboni jump head first into this year’s Spring season! Highlights, lowlights, any surprises? News that you may have missed since our last podcast: Pete Mackanin’s extension, Hellickson being named Opening Day starter, Vince Velasquez making the Opening Day roster as the fifth starter, and the signing of Will Venable. The reserve spots are likely down to Emmanuel Burris, Cedric Hunter, and Venable. Who makes the cut? The opening-day bullpen is rumored to include David Hernandez, Dalier Hinojosa, Brett Oberholtzer, Jeanmar Gomez, Daniel Stumpf and James Russell (9 Ks in 7 IP) with Mackanin advising that there is no clear closer. Who would YOU want to see close games for the Phillies? The final spot appears to be down to Andrew Bailey, Ernesto Frieri and Hector Neris. Who would you take? Note: Edward Mujica was re-signed to a minor league deal. They discuss why Velasquez over Adam Morgan and why Charlie Morton cracked the rotation. They catch up on former Phillies signing across baseball like Jimmy Rollins making the White Sox opening day roster, Shane Victorino starting the year in Triple-A for the Cubs, and Kyle Kendrick signing with the Angels after being cut by the Braves. They discuss the Futures Games to be held in Reading and Citizens Bank Park. March 31’s game will be the first in Reading since 2000 when the Phillies played a rare May game against the Reading Phillies. Finally, we talk final predictions: record, place in NL East, boldest prediction, and we find out what Steve and Ian think will define success and failure in April.